While Freddy was doing better with my bigger sized hiking boots, the heat and miles from the previous few days had taken a toll, the plan was for me to go on ahead, Terry and Freddy would just go at her pace, I would drop my pack off at the car, go back down and carry hers out of the Canyon for whatever distance remained. As planned, we got up super early (and were were not the first ones to get up and get going, seems most of the campsite had the same idea), packed what was left of camp (we packed what we could the night before) and headed off around 4:30am. The first thing of note you come to is the south bridge over the Colorado River. The phone struggled in the pre-dawn light, but here we are…. Freddy does not like bridges…. Terry was doing a great job helping Freddy. 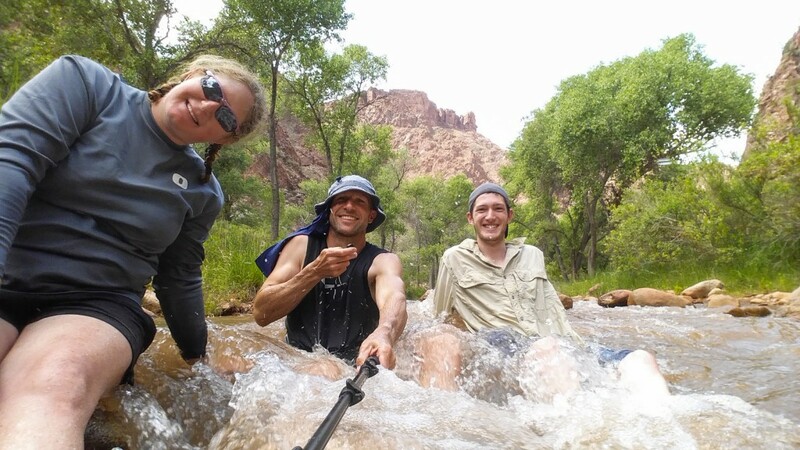 This is just one of the few small creeks that flow down in the many canyons. The views are really different going up the valley compared to the South Kibab trail. There is more water, more shade, and it is just well, very different. Even though I was heading up as quick as I could, I still grabbed a photo or two. It is just an amazing place. So humbling due to its size and timelessness, you feel so small and insignificant it is wonderful. We had packed about as much of Freddy’s pack into mine as we could, so it was heavy going, but I love the feeling of exertion, the feeling of the air getting thinner the higher you go so really did not mind. The hike out goes from around 2500 feet to 6800 feet. It is pretty solid climb! As we got closer to the top, the number of people really started to ramp up. 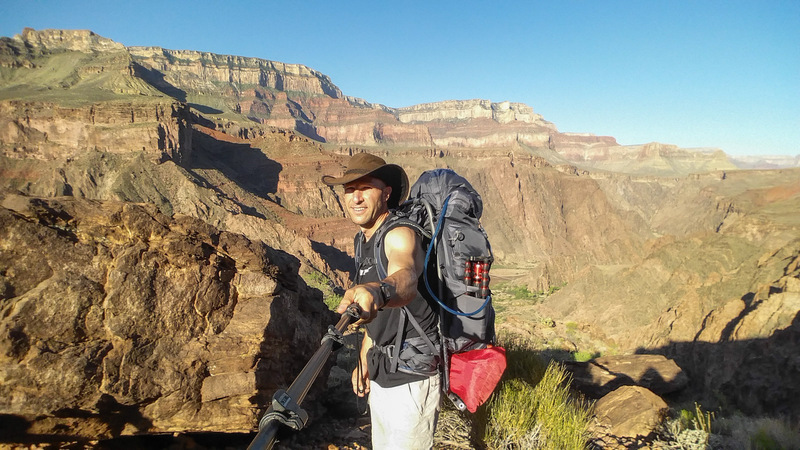 It was both annoying since most of them did not know that that the uphill hiker has the right of way and bemusing since a lot of them were not dressed to be as far into the canyon as they were…. It was downhill for them at this point and very few people feel any effort walking downhill. So there they are in their skin tight jeans in high heels with makeup and perfume to the max, laughing and carrying on, having totally no clue that they are at 6000 feet and the air is real thin. As soon as they turn around and have to walk uphill, things were going to get really breathless for them!!! Even more sobering is coming apon the guy that was laying down with a few National Parks guys giving some pretty serious first aid to him and arranging via their radios an air lift out for him…. There was nothing I could do to be helpful, so we pressed on. 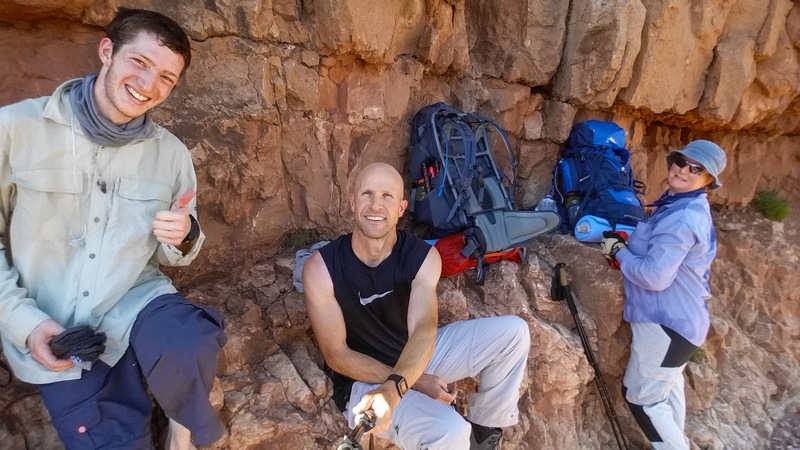 At the car, I had a quick refuel with some non-hiking food (mmmm, real food), swapped some clothing layers and headed back down without my pack. Before long, I met two familiar faces, grabbed Freddy’s pack and grabbed a photo. Here we are again really close to the top. Even with no pack you can see a tiny hint of, ahh, effort in Freddy’s face. Use that to try and imagine how much people were struggling to hike up after their giggling downhill goof off. [Side Note: The National Parks people do a great job. You can not stop people from going down, so they just have to manage to pick up the bits. A job that I really would not be very good at with all my excellent people skills and all. To be a little fair, some random people stopped to ask me how much further it was to such-and-such look out or so. I was happy to explain it to them – the rest of them were just ticking me off big time!]. One last look at the view from the top. You can clearly see the trail we had hiked up that morning. We pretty much used everything we carried. The extra layer of clothes (to keep warm) were clearly not needed, but were used as a clothing change, just to feel a little better. The jet boil stove is fantastic. We never used the water filter. We ate all the food we took. 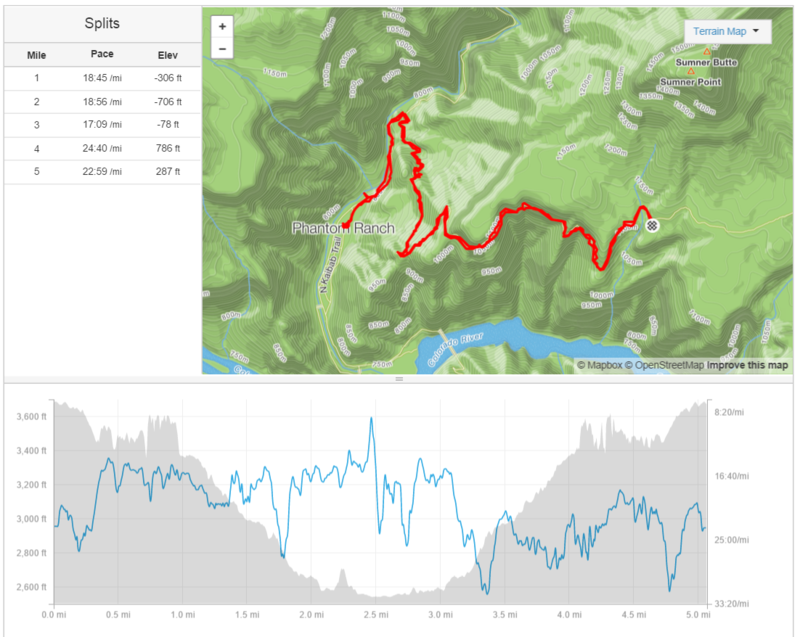 Here is the last of the Strava pace notes. It is a really good climb out. You can see the double dip I did when we went back a ways to get Freddy’s pack. My milage for the whole trip was pretty much spot on 40 miles, 63 clicks. It worked out to be pretty much spot on 10 per day. Terry did around 30, and Freddy 20. No question that my heat training in the months leading up to the hike paid off. Big time. Freddy said she would do it again if we could take 5 days and stop in more places that are closer together (ie, not so many miles each day). 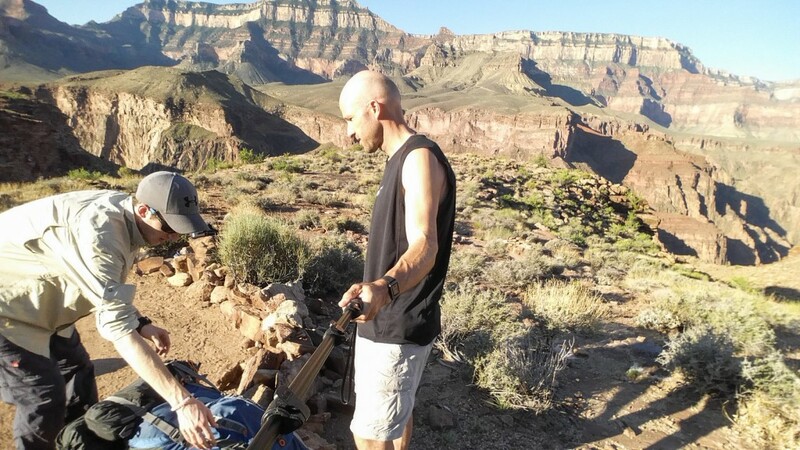 Hike the Canyon he said, it will be fun he said…. And it sorta was. The hiking for the day was supposed to have been much longer, but turned out to be pretty short, so we had some time to kill. Did I mention there was a creek? 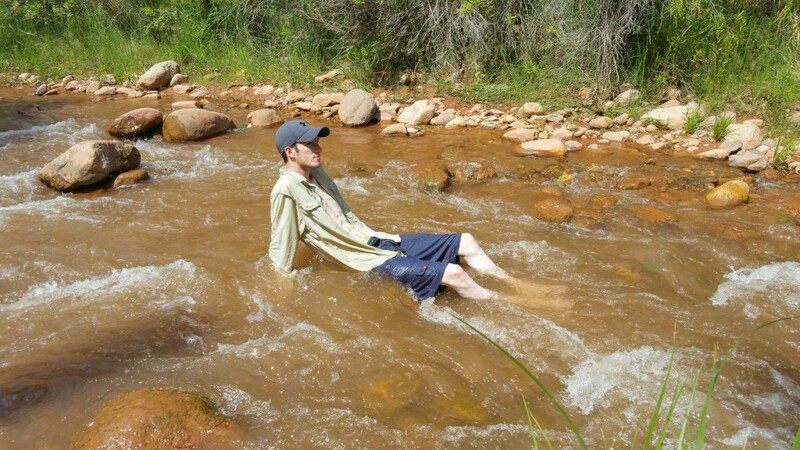 What is the best thing to do with a creek when it is a really really really hot day? So we did. For a good while. Once Freddy and I were done, Terry sat some more. Our clothes dried out super quick, so it was not a big deal to get so wet. Most of the campers took a dip at some stage through the day. But since they limit the number of people to the number of campsites, it never gets too busy. Terry is really getting into chess, and I knew that we would have some down time, so I took a little travel chess set with me. The look on his face when I pulled it out and asked him if he wanted a game was totally worth the weight to lug it down and back. 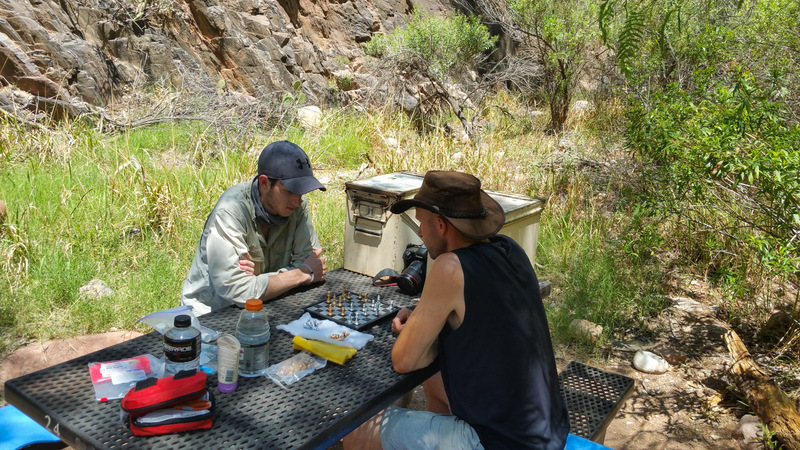 We got a few looks from other campers as well, mostly disbelief that someone would carry a chess set into the Grand Canyon, but eh, it was really cool to have a few games. So that’s how day 3 went. We just sat, ate, talked and hung out. Before long the plan for the next day was clear. Get up well before sunrise and get the last days hike done before things got hot. A day’s rest did both Freddy and Terry the world of good. 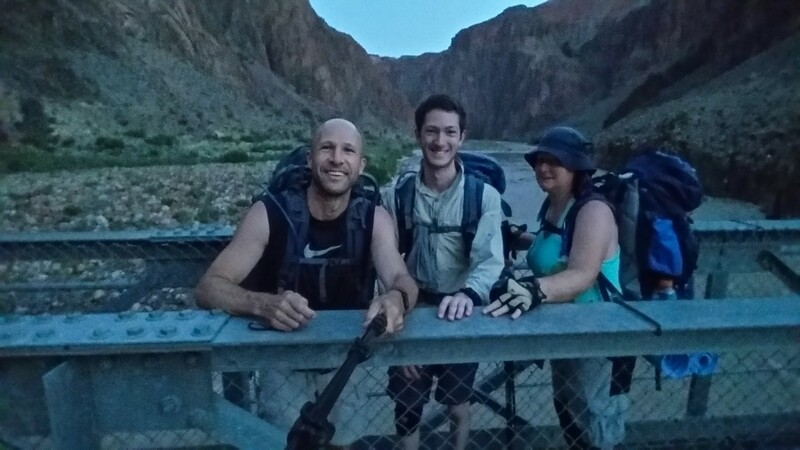 We were all up and getting ready to do the very quick hike back to Bright Angel campground before sunrise… Part of it was Freddy was really worried about the heat, and she was also still a bit worried about her feet. Freddy was wearing my hiking boots, I was in my what-are-you-taking-them-for-sneakers and so she was off like crazy before Terry was fully packed, so I hung around and took some pictures of him packing up. 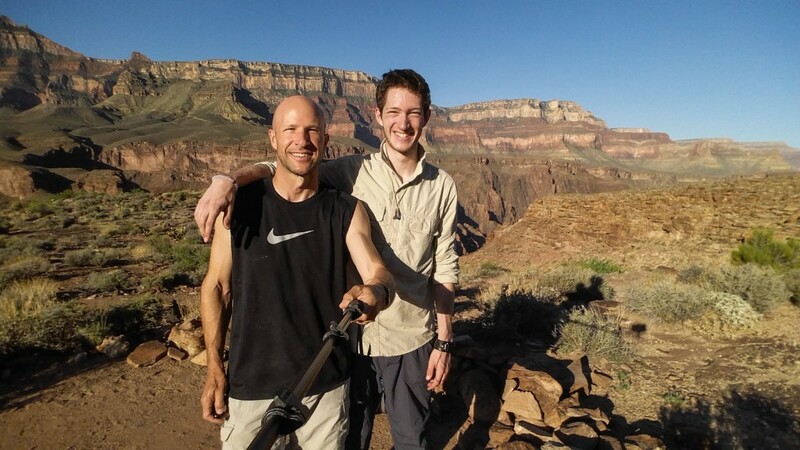 I figured it would be a long while before the two of us get a chance to come back and since one regret I have is not having enough photos of me with my Dad doing stuff together, we took the chance for a pretty epic selfie (dualie?). 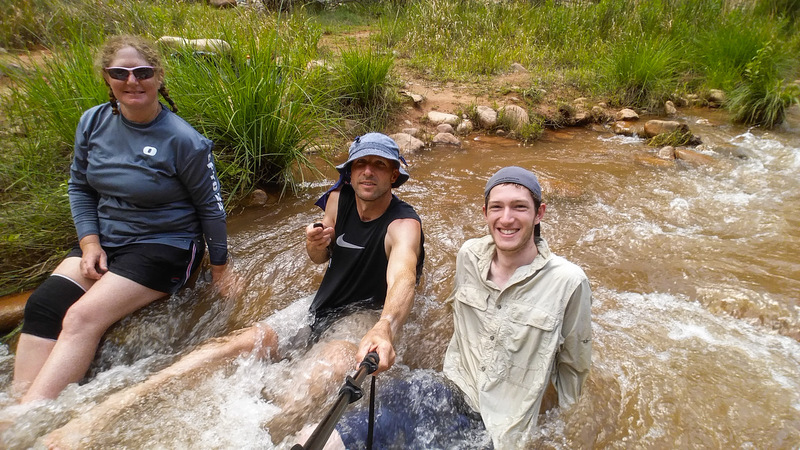 We are only going a really short distance, one that we had already covered a few times getting water, so we might have stopped a bunch of times and taken a heap of photos….. 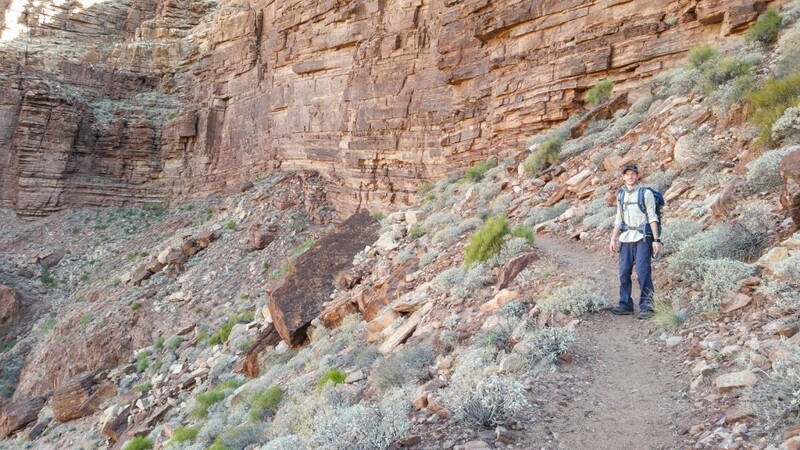 Here is a shot of Terry on the trail… Just check out the rock cliffs! We were slowly catching up to Freddy, here is a shot of her on the trail ahead of us. 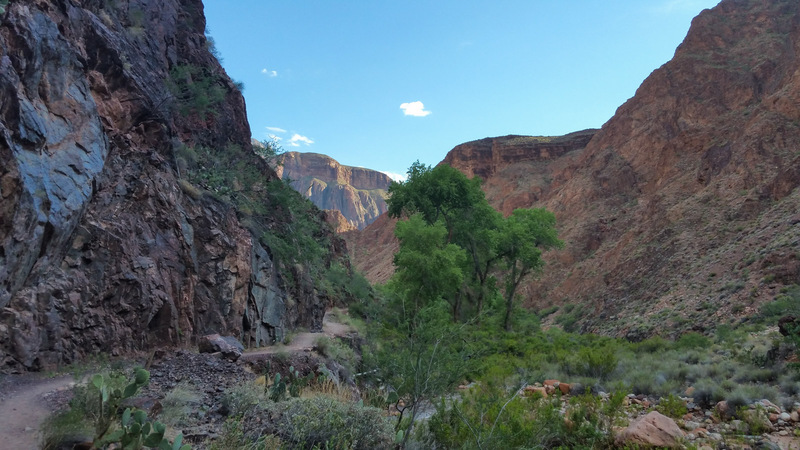 One of the other things I love about the Clear Creek trail is that you get to look over the river and see the South Kaibab trail. Not many people get a look at it from this angle. Before long, we found our way back to Bright Angel campground. There are two things of interest at Bright Angel. The first is a thermometer. Which speaks for itself. Have I mentioned it was hot? The second thing is that there is a creek. The day cooled off a little as the sun set. I set about making dinner with the jet boil and the rest of the troupe just chilled as best as they could. As we got fluid and food (both were important) into Freddy and as the sun set and the temperatures dropped, she started to perk up. Two important things happen that night. As we were packing our packs back at the house, I threw in an old pair of runners. 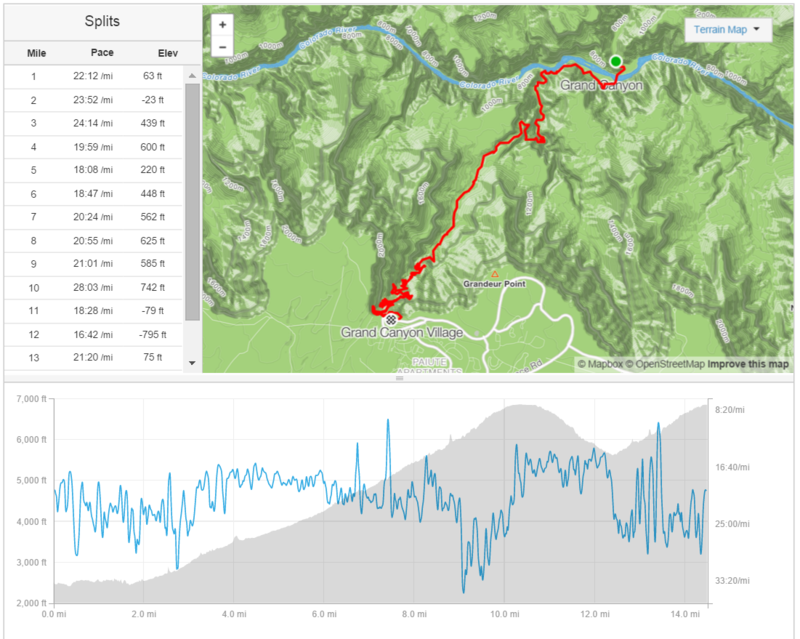 Freddy and Terry both really gave me a sustained hard time about carrying an extra pair of runners (shoes) to the Canyon and back… I just want that to be noted!… My plan was to use them in the hike up Clear Creek to the waterfalls and back. I did not want to get my main hiking shoes wet, they may not dry out overnight and I did not want to hike out of the Canyon, or any part there of, in wet hiking boots! (See, there was logic to my perceived madness). So, important thing number 1. Freddy needed to pee. She was in the tent when the need arose and our shoes were lined up outside the door, rather that fight with her hiking boots, she put mine on and the visible relief of putting her size 11 foot in a size 13 boot was very clear for all to see and hear. Important thing number 2. 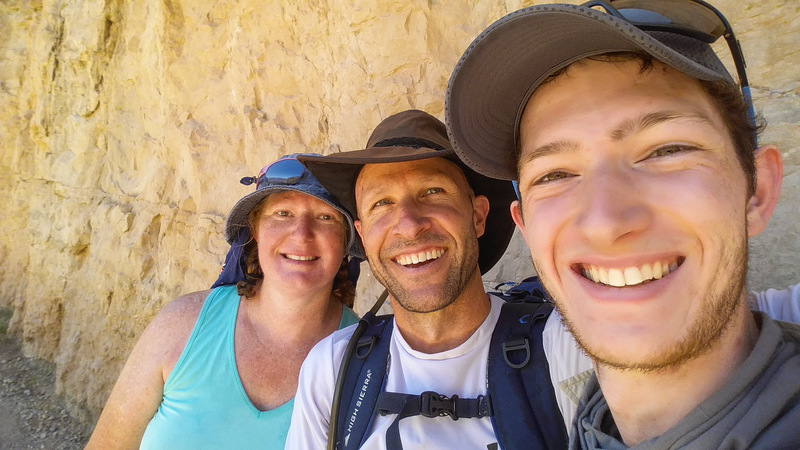 It became very clear after a few hours that Freddy was not going to be able to hike the 6 miles to Clear Creek and that we would have to stay where we were for the following day… Why is this important? 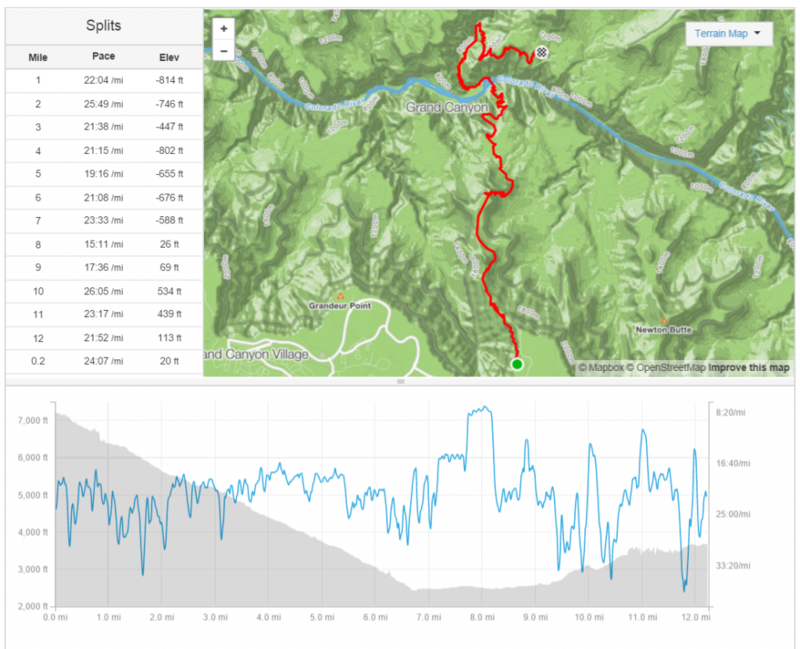 I had planed to filter water from Clear Creek to drink and to re-hydrate our meals…. There was no water where we were. None. I knew what was going to be required and so was not too worried…. We simply settled into the night and watched the sun go down. 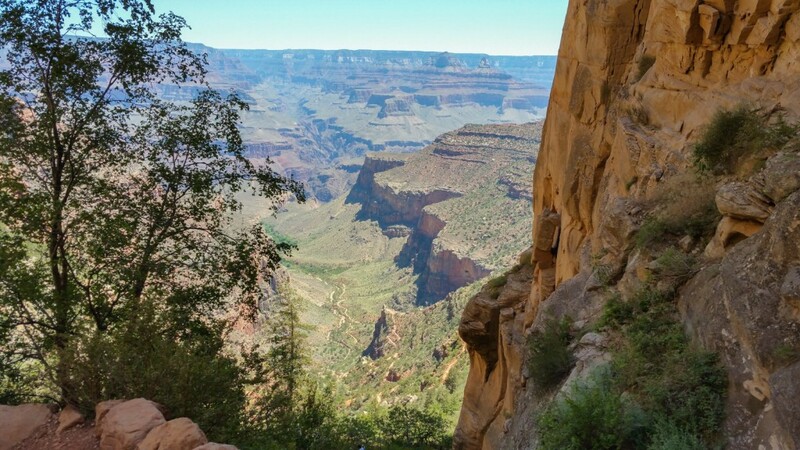 With a view like this on your front door step… it sure makes everything look small. (Do me a solid and click on this one to view it full size). Even as the sun fully set, it just did not stop! This is why I like the hike to Clear Creek. 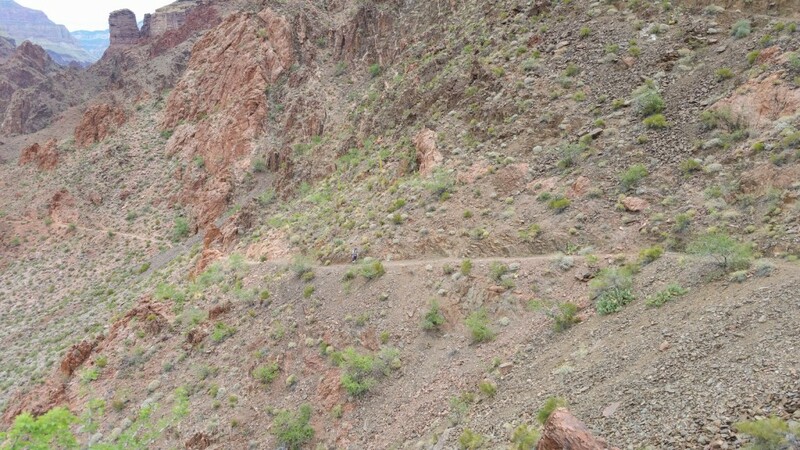 You get up out of the valley that Bright Angel Creek and Phantom Ranch are in. Even Indian Gardens does not have a view like this. 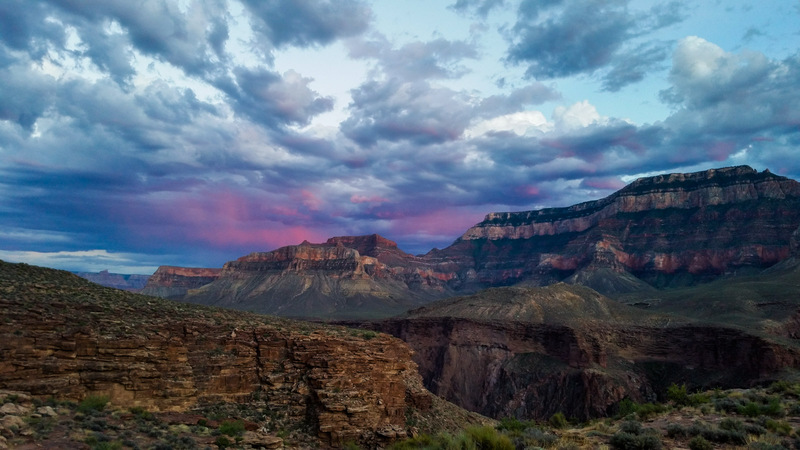 Next morning, before the sun came up, I loaded up the empty water bottles and drink bladders, grabbed some cash out of my wallet and headed back to Phantom Ranch to get water and ice. As you can see, it is a beautiful decent and climb, about 1000 feet altitude each way. And with views like along the way, it is as if the water is secondary…. 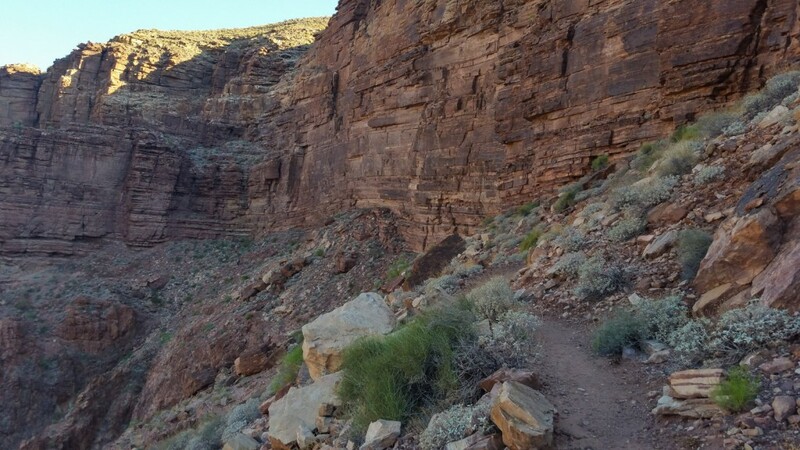 You can see the trail we are walking on… Its much more narrow and unmade than the main two trails that most people take to hike the Canyon. 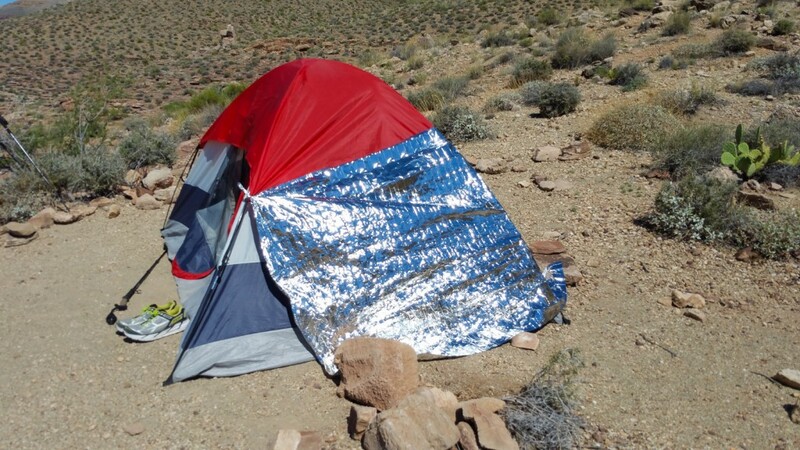 The day was heating up really quick and thankfully Freddy had the idea to remember that we had taken two space blankets with us. They are so light and compact, that there is almost no reason not to take them…. Anyway, we needed the shade, and pressed them into service on the side of the tent. I joked that we looked like a Martian lander or something, but the fact is, they made a massive difference to the inside temperature of the tent! So there we hung out of for the day. I went for the odd hike up and down the trail a bit to just get some alone time, but for the most part we just hung out and talked in the tent. If you know me, you know I love gadgets. The thing with gadgets however, is that they require power. Is that going to stop thebaldgeek?? Naaaaaahhhhhhh. Just a quick word about this….. When you charge a battery it gets hot. When things get too hot they go bang and so to stop this from happening, gadget makers put temperate sensors on their batteries and reduce the rate of charge if a battery gets too hot. Solar panels are put in the sun. That’s how they work. Things in the sun get hot. So, you have a solar panel with a short cord and a ‘pocket to place the device under charge’ on the back of the panel. Enough to say that I was in a viscous circle of trying to keep the battery cool and the solar panel in the sun. 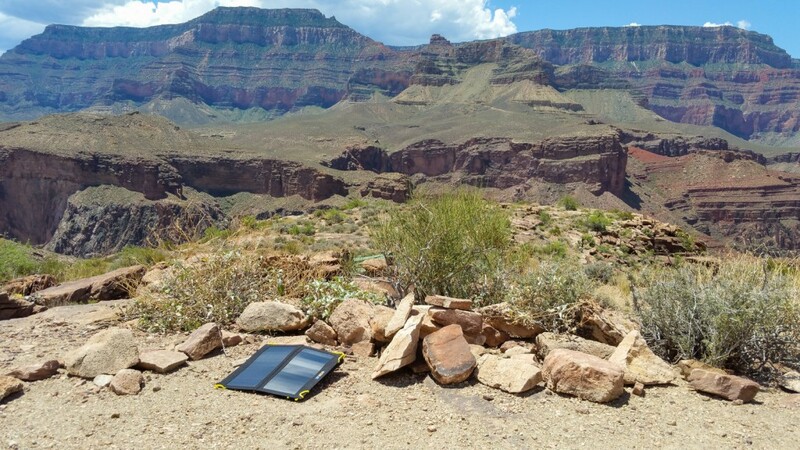 Next time, I am going to take a nice long USB cable so I can put the battery in the tent and the solar panel outside! 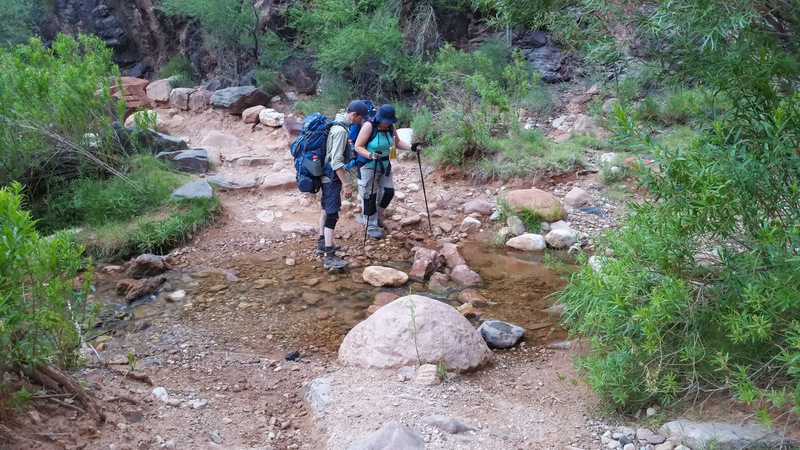 By the time evening came around, we ran the water numbers and yup, we were going to be short for dinner and the following days hike back to Phantom Ranch, so Terry and I gathered the empty bottles and headed off to get water. I did not say anything to him, but on this hike I deliberately dropped back a long ways so that Terry could have the experience of ‘hiking on his own’. He latter commented that he really was grateful for the experience…. The Canyon is like that. You get in the zone and are just captivated by the silence and the agelessness of everything you see. With no other humans in sight or sound it changes the mind and after a half hour or so there is a zone that few people get to enter. It’s pretty sweet. It has been too long since part one, so here it is for you to go back and refresh your memories…. The short catch-up version is, I don’t know how to use a fax machine. I don’t now how to select the correct weather forecast for the area we are heading into. We booked a motel in the wrong town. We caught the slow bus. Things started out Ok, but were heating up quick. Ok, so, as I said, the trip started out well enough, the slope is gentle and the steps are not too frequent. What we did not relize at this stage is that because Freddy was using the walking sticks, it made it hard for her to use her drink tube. So while Terry and I were sucking down a little bit of water pretty often, Freddy was not taking in anywhere near as much. At the next major stop, we had some food and proper fluids. Freddy commented that her shoes were starting to hurt, but nothing too bad, no blisters or anything, so we adjusted the tension on the laces and kept going. The further you get in, the more the logs (aka steps) kick in. Each one is a bit of jar. This is why Freddy was using the sticks, to help ease the jolt onto her hips, and feet. I will skip the really ugly photos, but we needed to stop a few more times and put bandages and stuff on Freddys feet to try and ease the pain and future pain. It was only as we got near the bottom that it became clear just how dehydrated Freddy was. After you go through the tunnel you come to the bridge that crosses the Colorado River. 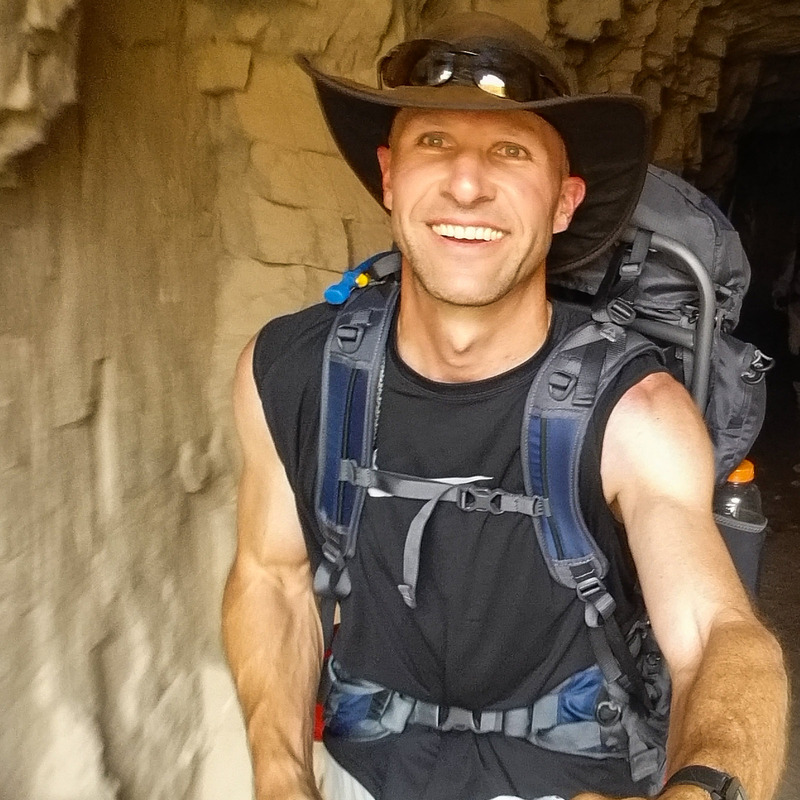 It has amazing light and it is a bit of a tradition for me to take a selfie as I go though…. This means that we are close to the first major resting spot. Phantom Ranch. 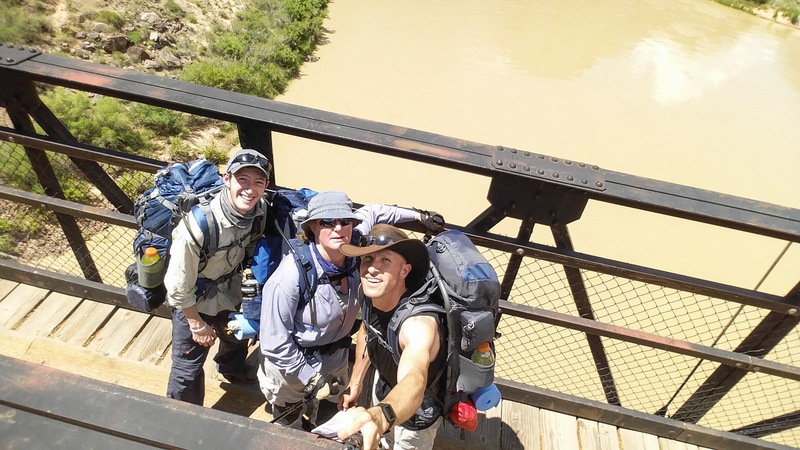 Here is a shot of the three of us crossing the bridge. One look at Freddy’s face pretty much sums it up for her. Not long after getting over the bridge and half a mile along the river, she called it and said that she really needed to rest. 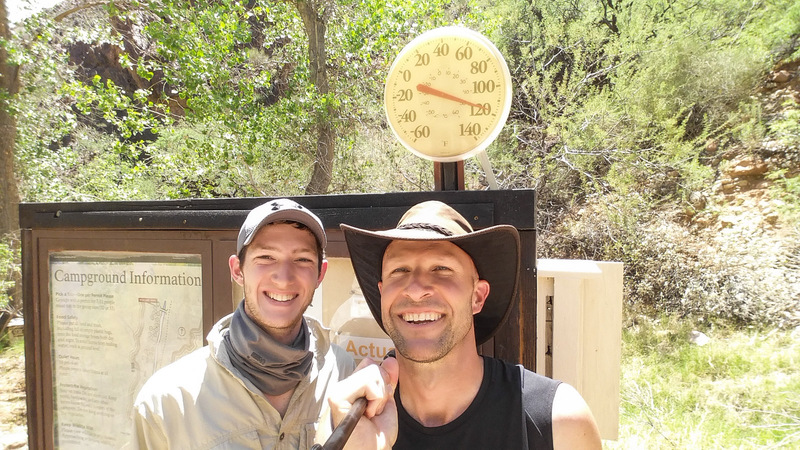 We got Freddy to the junction of where Bright Angel Creek meets the Colorado, there is a little shelter there with some shade. We sat her down, took her pack off, wet down her hat and scarf and told her to stay put. 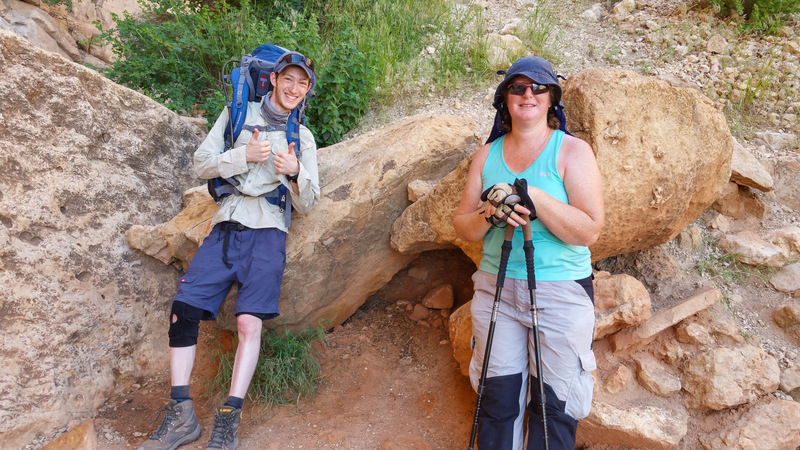 The plan was for Terry and I to go up to Phantom Ranch cantina, drop Terry and my pack off and then I was going to come back and get Freddy’s pack and walk back up to Terry (who was resting under the big trees). 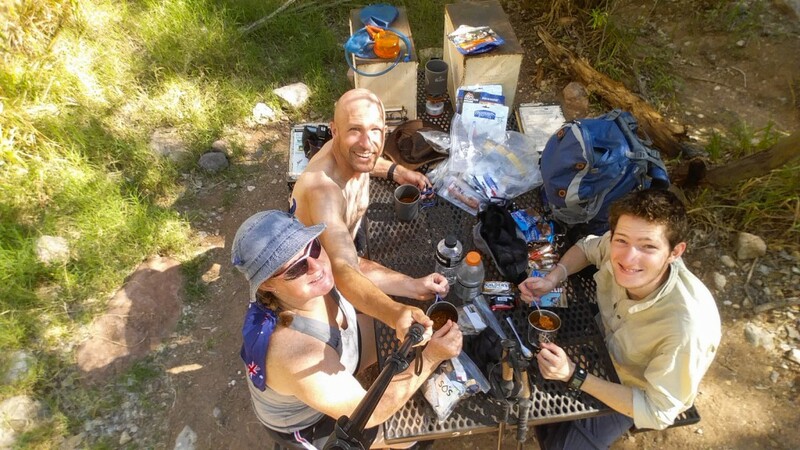 Once the three of us were all there, it was always the plan to rest up for an hour or two, have a solid feed and refill the water bottles before heading the two miles to the first camp spot toward Clear Creek. So that’s what we did. Terry and double timed it up to the cantina, dumped my pack and then I ran back down to where we left Freddy. When I got back to the little hut, she was no where to be seen. 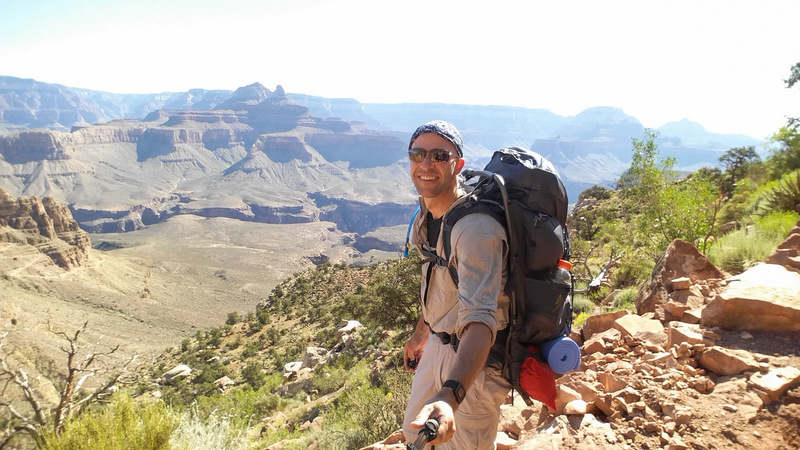 Here is my log of the trip into the Canyon. The blue line is our pace. It is in miles per minute. 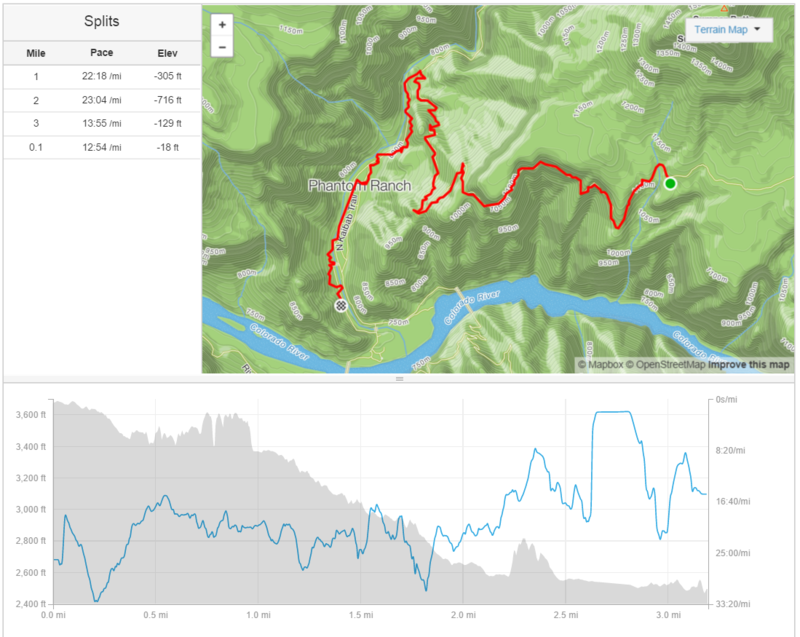 It is pretty clear the bump in pace around the 7 to 8 mile mark where first Terry and I went double time, then the big jump up where I ran (yes, ran) back to get Freddy. So, there I am, in the heat, looking for my heat affected wife… She had one job to do, sit in the shade… Just felt the need to point that out. One. Job. Sit. Stay. Turns out, she thought she was feeling better just a moment or two before I got back and so she got up, hoisted her pack and started to try and find the right path (there are a few since it is the entrance to the Bright Angel campground) that would take her to where she (thought) knew we would be. After a few minutes of me jogging around looking up a little of each of the trails, I found her wondering around looking slightly lost, but better. Her face had a little color in it. It was a shortish walk back to Terry and we caught a seat on one of the picnic tables under the tree and started to cool off and eat some real food. As expected, a few hours latter, she was feeling much better, but still had some sore feet. The camping permits are pretty clear, you must camp at the grounds marked on your permit, for us, that was Clear Creek. About 2 miles away, a solid but very very beautiful climb away. She is a little tough to spot, but here is a shot of Freddy on the trail. We got to the point where, since there was no one on that trail (one of the many reasons why I like it), I would quickly march ahead, drop my pack off, then jog back to Freddy, grab her pack and walk with her up to my pack. This really took a load off her feet. 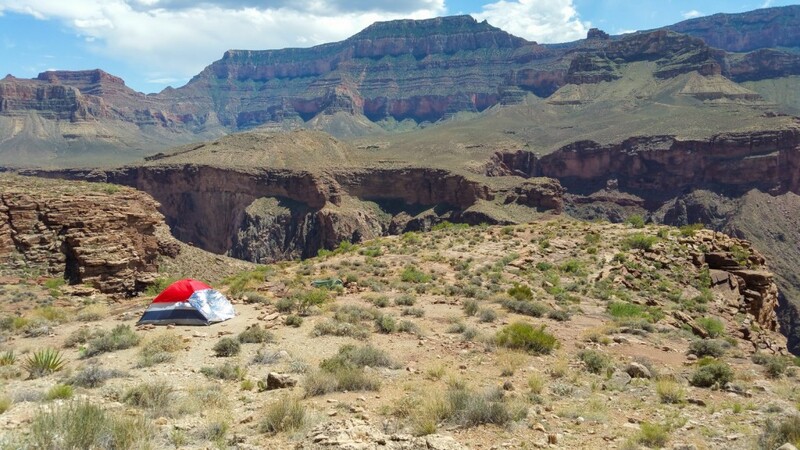 And so before long we got to the first spot where overnight camping is allowed along the trail to Clear Creek. And thus we made camp. (Terry’s tent is just to the right of ours). So, there we were. 3 hot ‘happy’ campers.